Technology / Solution　Benefits Arising from Standardization | Soldering robot - robot soldering - COSMIC CORP. The PSU500 is Automated Point Soldering Robot System developed for standardizing and stabilizing soldering. The PSU500 can support lead-free and silver-free solder, requiring no nitrogen gas. There is no problem to use high-melting solder wire because our PSU500 uses the high-temperature heaters. All-around “heat amount” stability is essentially important. Cosmic’s automated point soldering robot system PSU500 is stable because it cuts solder wire for supplying with constant amount. 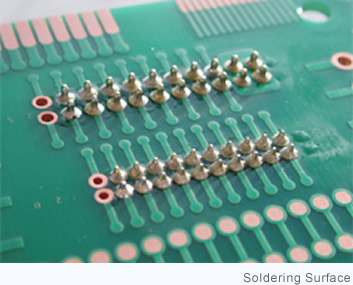 If solder volume is not constant, this changes the heat for melting solder and stable soldering is not possible. Ceramic heater in Cosmic’s automated point soldering robot is capable of raising the temperature approximately by 100°C every second. At point soldering, soldering tip touches to the work before soldering and its temperature goes down. However, PSU500’s soldering tip can quickly raise back to the original temperature which allows fast and instantaneous high-temperature soldering with the same conditions at all times. 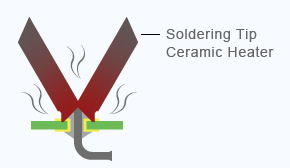 Solder does not adhere to the soldering tip because it uses ceramic heaters for the tip (automatic cleaning takes place at approximately 100 to 500 points), allowing soldering with almost same condition every soldering points. Projections and bridges will not occur since the soldering tip does not get wet. Our ceramic heater is different than metal type, PSU500 can always supply stable heat to the work and solder because our ceramic heaters have no solder “leaching” by formation of an alloy with the solder and no change in the shape of the soldering tip. a variety of soldering quality by followings. without nitrogen gas accordingly, no extra expenses. The melting temperature of lead-free solder is high and this requires increasing the temperature of the soldering tip. Metal soldering iron tip will be quickly oxidized and worn out if temperature is raised. This makes worse for the compatibility with the solder and causes poor wetting. Cosmic’s point soldering robot system, PSU500, uses a soldering tip at 500°C to 600°C even with eutectic solder. without really worrying about the temperature even with lead-free solder. Short life of soldering iron tip by wearing is becoming problem because it reflects to the production cost. enabling efficient soldering even with no nitrogen gas. PSU500 encloses and heats soldering points. It enables soldering without nitrogen gas even with lead-free solder.